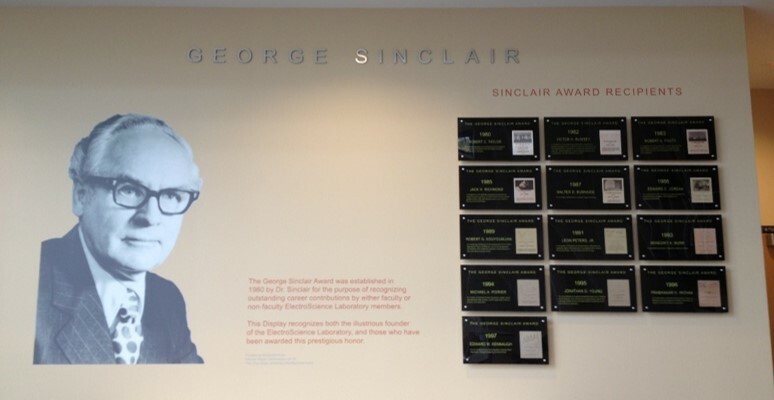 George Sinclair, the Founder of ElectroScience Laboratory, then called the Antenna Lab.The George Sinclair Award recognizes an individual for distinguished technical contributions and/or service to the Ohio State ElectroScience Laboratory (ESL). The award honors the memory of Dr. George Sinclair, who exhibited exemplary standards in his own technical research and administrative leadership at the Antenna Laboratory (later renamed "ESL") which he formally founded in 1942. Please visit ESL History or ESL Directors page to learn more about our history, the founders and Directors of the ESL. The George Sinclair Award Selection Committee is pleased to announce the call for nominations for the 2017 award year. Nominators should complete the award nomination form and send it to Michelle Diefenbach by November, 22, 2017. Please click here to download the nomination form. Eligibility criteria: Nominees may be current or former ESL faculty or researchers, or former ESL students or post docs. The George Sinclair Award recipient should be internationally recognized for his/her outstanding technical contributions, and those contributions should have had a direct impact on maintaining or enhancing the excellence of ESL. This criterion could be measured, for example, by professional awards and recognitions received from leading professional societies. The George Sinclair Award recipient should have provided technical leadership on a large complex ESL project requiring them to demonstrate exceptional abilities and effort to carry the project to a successful completion for which ESL receives national recognition and/or launches ESL into other new related future projects/areas. The George Sinclair Award recipient should provide administrative and/or technical leadership to navigate a path for ESL to move into new research areas and facilitate obtaining funding for those to meet current and future challenges of EM technology. The award will be made during the years when a qualified recipient is selected by the Committee. The winner will be announced at the annual ESL Awards Luncheon in December. 15 Inder "Jiti" Gupta 2017 For his excellence in research, and his exemplary leadership of the ElectroScience Laboratory including establishing an internationally recognized program in global navigation satellite sytems (GNSS). As well as playing a major role in the establishment of the Compact Range, CERF, and COUNT consotria. 14 John L. Volakis 2016 For his excellence in research, and his exemplary leadership of the ElectroScience Laboratory (ESL) including establishing new research areas in electromagnetic sensor technologies and securing a new ESL building. For his contributions to electromagnetics including Radar Polarimetry, Transient Scattering and the K-Pulse. For fundamental contributions to the Uniform Theory of Diffraction and the importance of these contributions to research at the ElectroScience Laboratory. 11 Jonathan D. Young 1995 For is contributions to ground penetrating radar and to transient electromagnetic wave analysis and measurements. Also for his dedicated selfless service and administrative leadership of the ElectroScience Laboratory. 10 Michael A. Poirier 1994 For creative contributions toward advances in digital, optical, and advanced radar systems, and for supporting numerous students and researchers. For pioneering advances in frequency selective surfaces. In recognition of his technical achievements in diffraction and scattering theory which have led to Corrugated Horns, Ground Penetrating Radar, and Low Observable Technology. For pioneering contributins to the development of the Unifor Geometrical Theory of Diffration, and for the development and teachng of an oustanding graduate course sequence in advanced electromagnetic theory. For contributions to the formation and early success of the ElectroScience Laboratory, and for leadership in engineering education. For his major contributions to compact range technology. In recognition of his nationally recognized contributions to integral equation solutions , but most of all for his ever present guidance both to ESL staff members and to many others in the use of such techniques. In recognition of his dedicated and unselfish service to the ElectroScience Laboratory, and for his leadership skills, which contributed so much to the growth and character of the laboratory. In recognition of his oustanding leadership in research and graduate education which enabled the Antenna Laboratory (now The ElectroScience Laboratory) to expand into an institution, whose excellence in electromagnetic research and it's application, are internationally recognized. Exceptional dedication and contributions to the research goals and achievements of The Ohio State University ElectroScience Laboratory.